Jonathan spoke to us about how he continues to use the knowledge and experience he gained at Energy Hack 17 in his role as Engineer at global engineering consulting firm Arup. What was your team’s Hack idea, how did your team work together to come up with the idea, and did the idea progress after the Hack ended? Our team’s idea was to set up a community-owned renewable gentailer (electricity generation and retailing business) in Bendigo, Victoria. We came up with this while thinking about how to solve the problem presented by Simon Holmes à Court of “closing the gap” in community renewables, which is the difficulty communities face in the current electricity market when trying to purchase energy from large projects that they have funded. We had a great team with people from industry, consulting and academia, and knew a reasonable amount about the Bendigo energy system because some of us had worked on a project there. It just so happened that Bendigo was an ideal pilot location for a concept like this, with a large enough population to justify setting up a retail business, good local renewable resources, an engaged community, and a potential large-scale pumped hydro energy storage project in the works which would form a key part of the gentailer’s wholesale market risk management strategy. We spoke to the City of Greater Bendigo after the hack about the idea and discovered that they had recently and independently come up with a very similar concept themselves, and Arup is now working with CoGB to progress a feasibility study. How did you utilise the mentors’ expertise to further develop the idea? The mentors were great, and all had something different to offer our team. Some were well-positioned to provide quite useful and specific advice, like lawyers and data specialists, while others were just good at asking tricky questions and poking holes in our idea. This gave us areas to focus on in order to flesh out the concept. What was the energy or vibe of the event last year? From your perspective, what was the highlight? The overwhelming feeling I got was generosity, with so many people giving up so much personal time on the weekend to help and participate. Everyone seemed to bring an excited and motivated attitude to the event which made it a really fun and dynamic place to be. The space we had in the Melbourne School of Design was great for the event and definitely helped foster a collaborative environment. How have the skills you developed as a Hack participant helped you in your role at Arup? The amount I learned about the energy industry over the course of 48 hours blew me away, and I have no doubt that I use different bits of that every day in my work at Arup. It was also a great demonstration of how much progress you can make on an interesting idea if you push yourself and surround yourself with great support, which is a lesson I try to apply in my job. 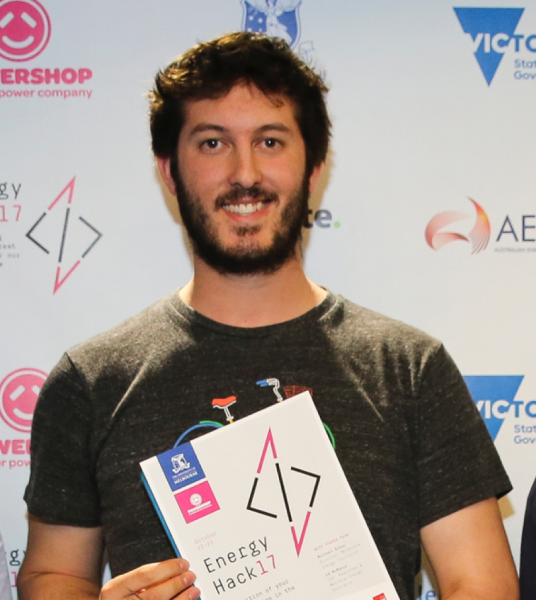 What is the biggest thing you got out of Energy Hack 17? Two things: The community gentailer project itself which we really hope progresses as I genuinely think it could be a game-changer for the community, and also just meeting so many people from across the energy industry and having interesting conversations. It was a fantastic collection of people in one place.